This remarkable book is a valuable resource for those wishing to play and sing the music of this extraordinary 18th-century blind harper. 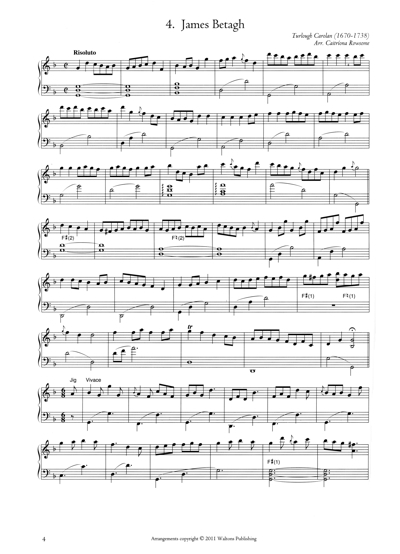 This comprehensive collection gives a unique perspective to the music of the great Irish harper-composer, Turlough Carolan (1670-1738). Caitríona Rowsome has combined Carolan’s surviving airs with sensitive and appropriate harp settings, metrically matching them with Carolan’s surviving lyrics for the airs. Many of the airs are not commonly known as songs, and some include lyrics published here for the first time. For each of Carolan’s Irish songs, an English interpretation is also provided. These are in the form of translations, paraphrases and, in some cases, English songs that give a context to – and a broader understanding of – Carolan’s Irish verse. Particularly fascinating and enlightening are her translations of the Irish lyrics and poems, which give us an insight into Carolan's love for life, extraordinary range of friends and his deep affection for them, both male and female. Caitríona Rowsome, an accomplished harpist herself, has arranged all 226 airs for the Irish harp and has included a detailed explanation of the background of each and about the patron or friend for whom Carolan composed the music. The arrangements vary from simple to complex and will suit a range of skill levels. Historical notes are also provided, as well as an appendix and notes on ornamentation. All 226 airs are included on 4 CDs and are played on a Salvi harp by Caitriona Rowsome. conclusive evidence, may or may nor be by Carolan. 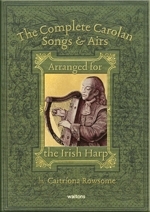 This remarkable book The Complete Carolan Songs & Airs arranged for the Irish Harp is a valuable new resource for those wishing to play and sing the music of this extraordinary blind harper who lived in the 18th century and left to us, as the author states, ‘his legacy of creative genius in composition'. Caitriona, a harpist herself, has arranged all 226 airs for the Irish harp and with each a detailed explanation about the patron or friend for whom Carolan composed the music. Particularly fascinating and enlightening is her translation into English of Carolan’s Irish words, which give us an insight into his love for conviviality, good company and the presence of friends, both men and women. In offering sincerest congratulations to Caitriona Rowsome on a truly great achievement, I wish this book every success for the author and the publisher, Waltons Music Ltd.